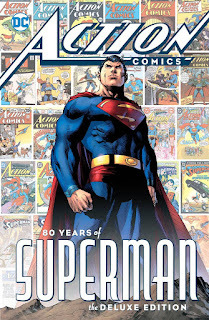 As noted above, the top hardcover and top reordered item overall was DC's Action Comics: 80 Years of Superman hardcover, which previously had topped the advance reorder charts. It releases in shops today. The Infinity Gauntlet trade paperback repeated yet again as the top reordered softcover; the book wound up 17th overall in the charts for March, released earlier this week. Dark Nights Metal #6, which was the top selling comic book for March, will be adding to its total, as it was the top reordered comic book for the week. The top reordered comic book from the month of April was the top reordered comic book last week: Amazing Spider-Man #798, which went on sale April 4. 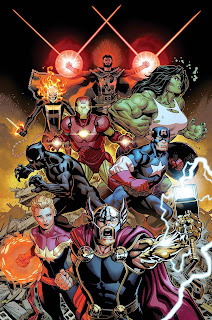 The first Marvel Fresh Start book has made its appearance: Avengers #1, which is slated to release on May 2. (There is an escalating discount opportunity tied to retailers' orders of Avengers #680, but it's not known where the issue would fall in the chart below had it been based on invoiced dollars rather than cover price.) At least so far, Marvel's reported dual-numbering of the Fresh Start titles doesn't seem to be reflected in Diamond's nomenclature for books. Amazing Spider-Man #800 topped the advance reorder charts once a while back; due out May 30, it took second. The top April-shipping comic in advance reorders was the Stuart Immonen variant of Amazing Spider-Man #798, out on April 25. More DC comics appeared in this chart than we've seen in a while; that includes DC Nation #0, already announced to have a million copies ordered. For a quarter comic to make a dollar-ranked list, numbers like that would certainly help. A storyline in the Mighty Morphin Power Rangers titles has been getting attention lately; Mighty Morphin Power Rangers #25's second printing took eighth. No hardcovers or softcovers made the advance reorder chart last week. We've seen enough reorders and advance from the past few weeks from Diamond Comic Distributors to be able to collate some information onto pages for April 2018 and May 2018. Check them out for a further glance at the future.